As our little blog keeps growing and growing, we’ve tweaked things around a bit and I want to let you know about a new category we’ve made. It’s called Winter Wear! 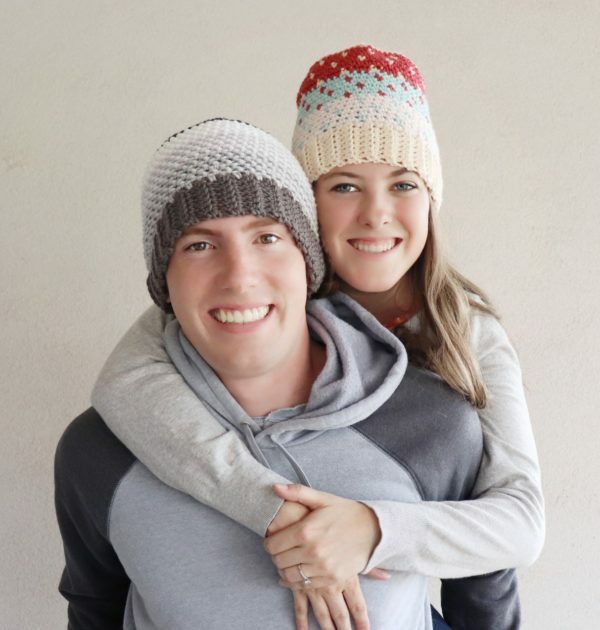 Hannah and I talk frequently about what types of projects we like to crochet, baby blankets are definitely number one on the list, but after that, I really enjoy making hats, mittens, and scarves. They are great for first-time projects because they take so much less time. First up, my daughter Haley’s very first project she designed, the Color Dipped Scarf. It’s made with the simple mesh stitch, which is just alternating single crochet (US) and chain stitch. She made this with Bernat Softee Chunky and I loved how great it turned out. That yarn seemed to help make her beginner stitches look really good. I made these with Patons Wool Roving and they turn out so well! I include a video tutorial to show you how to easily insert the hair tie. Also, there is NO joining of the rounds in this hat, you just make it in a spiral and it works up so fast. Another great project I have for winter wear is the matching Sprig Stitch Mittens. I mean, if you’ve taken the time to make the hat, why not add a pair of mittens why you’re fresh on knowing the Sprig. I did use a different stitch for the wristband than I did on the hat, but it still looks okay. You can always use the same stitch as the hat though. And, as I’m writing this, I think I better get to it making a Sprig Stitch Scarf to complete the set! That’s a glimpse into a few of the projects listed under the heading Winter Wear and I hope you’ll click to see all of them. I really have to say, that is what I love about my website, it’s very easy to see each project. I swear I smiled all day long after reading this, I’m still smiling! I really can’t thank you all enough for coming to Daisy Farm Crafts and being a part of our story. I only set out crocheting baby blankets in hopes that my oldest daughter Hannah might be blessed with a baby. But also had the thought to document them on a website, because crochet is important to me, and I wished I had my Grandma’s crochet patterns. You can still see that original Daisy Farm Crafts website. It’s a blogspot site, I started because it was the easiest thing to do! But since DFC has grown, I hired a real website designer but told her I wanted it to be the easiest place in the world to navigate. I hope you find that to be true too! So that’s me! I hope you’ll come find me on Instagram or Facebook! I’m mostly on Instagram sharing the blankets or projects I’m making as I go. So if you’re interested in seeing what’s coming up, that’s the place. But also, feel free to subscribe to the newsletter (upper right-hand corner where is says sign up.) It’s more of an email when I publish a new pattern or post something here on the blog, than a newsletter, but a fun way to keep in touch. Thanks for stopping by and have a wonderful crochet day!